Introduction: It is the 14th century, and everyone is ruled by Holy Inquisition. You have been accused of witchcraft and incarcerated to await your awful death by the hands of a executioner nicknamed “Bloody Elbow”. He is famous for his love of disgusting tortures and violence, leading to a slow and agonizing death… You have only one hour to try your fate and escape the dreadful dungeon in the guarded castle! Our game master, Daniel, was HILARIOUS! Just like Da Vinci's Challenge, this room was incredibly designed with the kick of horror. 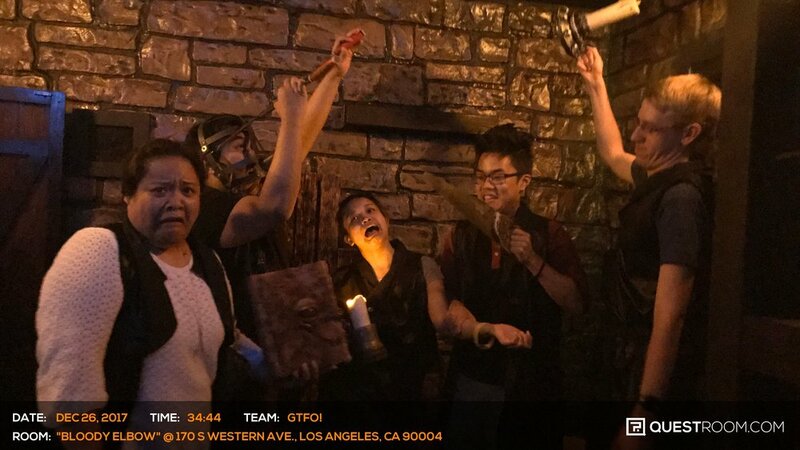 My girlfriend's sister wanted to kill me in the beginning due to the initial scary feeling the escape room presented.You are lead into the escape room with a bag over your head. To give you an example of how scary it can be, I was lead into the room and tied to a torture bed. Yup! That was me. Your hints are given to you via voice of an old man or a creepy little girl. The puzzles were abstract and challenging enough together with the creepy feel of the room. Some of the puzzles were very clever and lead to "Ah-Ha" moments. Don't forget to wash your hands after this escape room if you touch the water. You'll know what I mean. I, once again, got in trouble for climbing a hay block to reach a lock. DON'T CLIMB! Bloody Elbow is a horror thriller with great and challenging puzzles.